Tracing their history back to at least the 18th century from the Netherlands, doughnuts were not always round with a central hole or topped with chocolate and other sweets. This shape that we know and love about doughnuts in the US came about in only 1847, and was meant to improve the cooking of the fried dough. Now, numerous doughnut creations can be found across the U.S., with curious fillings, clever toppings, and trendy decorations reigning supreme. Learn more about New Jersey’s best doughnut shops by reading on. Go early before they sell out, as Curiosity Doughnuts draws doughnut lovers from both New Jersey and Pennsylvania, pleasing both cake and yeast doughnut lovers. Enjoy beautiful-looking doughnuts that are packed with flavor. On your visit to Curiosity Doughnuts, you might find flavors such as s’mores, candy cane crullers, cider with burnt cinnamon, butter pecan, white chocolate, and cider glazed clusters. If you are looking for something very unique, Curiosity Doughnuts has doughnut [hot] dogs. Broad Street Dough Co. offers visitors a range of filled and round doughnuts with some extravagant options for those seeking an extra sweet boost. An over-the-top doughnut creation is their red velvet doughnut dipped in chocolate with cream cheese frosting, M&Ms, caramel drizzle, and rainbow sprinkles. Other options include devil’s food chocolate doughnuts filled with peanut butter and cream cheese or their popular red velvet dipped in vanilla and Oreo crumbs. When you place an order at Beignets, you can expect your doughnuts to be made to order and handed over to you while they are still warm. You can opt to select from the doughnuts on their traditional menu or create-your-own to fit the exact doughnut you are craving. 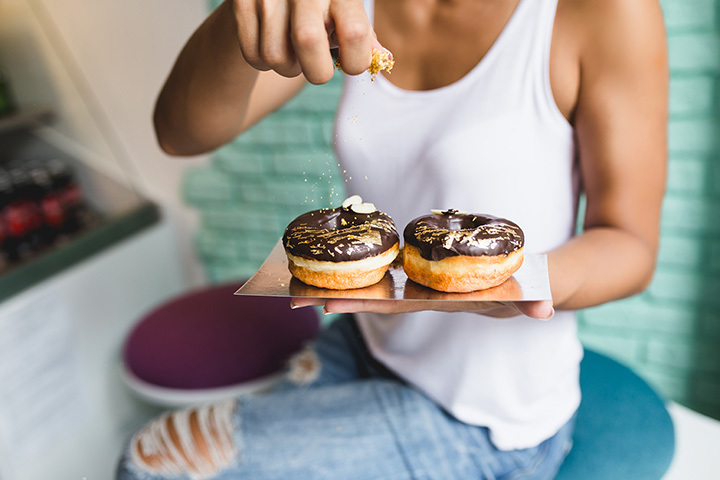 Doughnuts on their traditional menu include Toffee for your Coffee, which is a caramel glazed doughnut topped with pieces of toffee or the Lemon Pucker, which is a lemon-glazed doughnut dusted with powdered sugar. Beignets has also been inspired by the coffeehouses of Europe, so you can expect a range of espresso drinks on offer. Purple Glaze Donuts aims to make your life sweeter by blending unique flavor combinations with the traditional to create beautiful doughnuts that are Instagrammable and delicious. Flavors and toppings vary and the menu is conveniently separated into plain, simple, and fancy & filled sections. An example off their fancy & filled menu is French toast, which is a cinnamon and sugar doughnut with cream cheese filling, topped with a drizzle of maple. Purple Glaze also has a large menu of vegan doughnuts. Uncle Dood’s Donuts makes their doughnuts fresh each day and tops them all to order. Flavor options change monthly with their regulars always on rotation, but you might expect to find plain, powdered sugar, peanut butter, s’more, cinnamon and sugar, and more. They also have creative flavor options like French toast, Samoa cookie, and Fruity Pebbles. The family-owned Top That Donuts is a casual doughnut and coffee shop with both seasonal and create-your-own menus. The unique create-your-own menu is what makes this doughnut shop stand out among others in the state as you can pick your own glaze, like maple, lemon, or chocolate, add a filling, and adorn it with toppings such as bacon, peanut butter chips, or mini marshmallows. They also offer a specialty menu and seasonal specials, like s’mores and Sinners Delight, that are all drool-worthy. Open early (at 6:30 a.m.), Donuts Time is ready to take your order as you make your way to work. In addition to breakfast sandwiches and several options, Donuts Time also serves “donutwiches,” which are sandwiches built on one of their doughnuts! One delicious “donutwich” options is the bacon grilled cheese—made with cheddar or American cheese and bacon on a grilled maple doughnut. If you want something special for a birthday, Donuts Time also takes orders for Giant Donut Cakes, which come in a variety of flavors and can be decorated with your specified message. Shore Good Donuts creates specialty doughnuts that are baked fresh daily. This spot is loved by locals and visitors alike and welcomes visitors coming straight off the beach in need of a doughnut and coffee break. Delicious options include the warm cinnamon and sugar, creative Inside-out Jelly, and the Everything doughnut. The specialty doughnuts are seasonal, but you might get to savor the Creamsicle doughnut, Coffee Crunch, or Peep doughnut. Another popular menu item is the doughnut sundae. Open since 1953, Ob-Co’s Donuts has reasonable prices for their freshly made doughnuts, so you’ll definitely want to take a dozen to go to surprise your colleagues or family. Favorite doughnut flavors include German chocolate iced, plain, cinnamon apple cider, red velvet, and cinnamon jelly. On the menu, you’ll also find mini doughnuts in a variety of flavors, jelly squares, and knots. Don’t forget to call ahead if you’d like your order to be ready upon your arrival. At Ob-Co’s, you can also special order doughnuts for a gender reveal party or other special celebration. McMillan’s Bakery has been serving their freshly baked doughnuts, cakes, pies, and cookies since 1939. Using only the best ingredients, they bake all of the traditional favorites. Taste test their glazed jelly doughnuts and their cream-filled doughnuts, which are so good you might want to take home a dozen.